LOS ANGELES, CA (April 1, 2019) – BOOM! Studios, under license by Hasbro, Inc. (NASDAQ: HAS), announced today that one of the biggest mysteries in Power Rangers history will be revealed as the GO GO POWER RANGERS series joins the epicNecessary Evil event in July 2019. New York Times Bestselling author Ryan Parrott is a writer in multiple mediums. A graduate of Chapman University, Parrott has written on television series NBC's Revolutionand Hulu's Chance. In comics, Ryan was a co-writer on DC's Batman: Gates of Gotham, several of IDW's Star Trek titles, including Starfleet Academy, Boldly Go and Manifest Destiny, as well as the NBC series finale Revolution: Endgame. Parrott was one of the key architects of the landmark Power Rangers: Shattered Grid comic book event and currently writes Saban’s Go Go Power Rangers at BOOM! Studios, along with creator-owned projects Volition and Oberon for Aftershock Comics, and lives in Los Angeles with his wife. He will become the series writer of Mighty Morphin Power Rangers beginning with issue #40 in June 2019. “Two years ago, I started on GO GO POWER RANGERS with the goal of crafting a series that placed an emphasis on character and focused as much on teenage relationships as it did on giant monsters. Naturally, when I was offered the chance to write Mighty Morphin Power Rangers, I assumed my time exploring the personal lives of the ‘Teenagers with Attitude’ was over. Thankfully... I was wrong,” said writer Ryan Parrott. “Now, while the current iteration of GO GO POWER RANGERS is about to draw to a close, an exciting new chapter awaits. I'm thrilled to have the incredible talents of Sina Grace and Francesco Mortarino coming onboard and I promise that Go Go's style and sensibilities will remain constant, even as we introduce new and familiar characters, recontextualize iconic series moments and explore bold new areas of the Power Ranger mythology. I really hope you all come along for the journey." Sina Grace is a writer and artist living in Los Angeles, CA who has earned prestigious nominations for both the GLAAD Media Awards and the PRISM Awards. He is best known for his slice-of-life memoirs at Image Comics, including Self-Obsessed and Nothing Lasts Forever; the highly anticipated reimagining of Jughead's Time Police at Archie Comics; and the critically-acclaimed, landmark Iceman series at Marvel Entertainment. Grace has been a part of the Power Rangers comic book series at BOOM! Studios from day one, illustrating variant covers for the chart-topping Mighty Morphin Power Rangers #1, along with both writing & illustrating one of the comic book stories celebrating the 25th anniversary of the pop culture phenomenon in 2018. Ghosted in LA, Grace’s new original series at BOOM! Studios, will launch in July 2019. 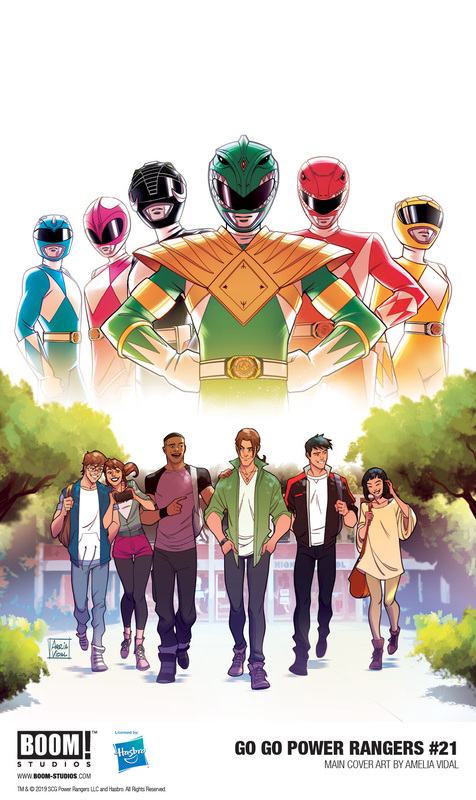 “As a lifelong Mighty Morphin Power Rangers fan, and I'm thrilled to work beside Ryan on one of the most exciting chapters in the Rangers' history,” said writer Sina Grace. “Mom, if you're reading this: thanks for waiting in line before work to get me that Megazord." “Till I started on my first page, working on GO GO POWER RANGERS sounded incredible. Now that I'm on board it's even better than I ever imagined, so it’s time to wake up from this dream and give 100% to draw these issues,” said artist Francesco Mortarino.